Renault’s 2016 car. GIF via YouTube. 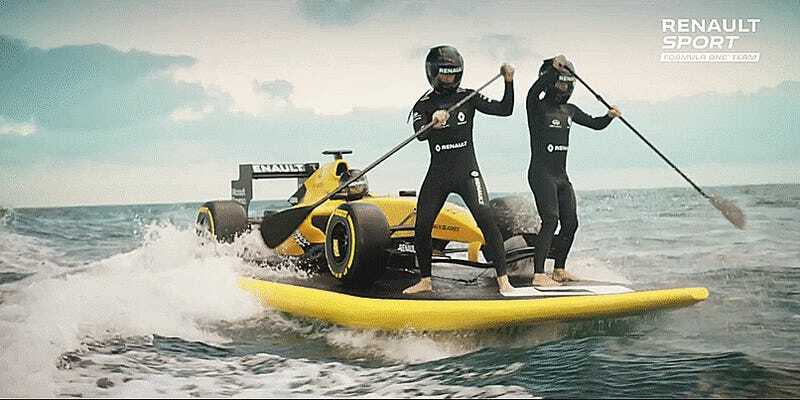 Formula One’s grid in recent years has been 50 shades of mind-numbing grey, which Renault Sport F1 Managing Director Cyril Abiteboul described to Motorsport.com as embarrassingly ugly. So, Renault wants to fix that, starting with a new bright yellow car and hopefully following up with a series of art cars. Frankly F1 cars are ugly. I am ashamed by what we are doing. And frankly some teams are doing even worse than the regulations are driving us to do from a performance perspective. So we wanted also to be just good looking. Yellow! This year’s Renault is a bright sunflower yellow! While it’s hard not to love the classic black and gold of the Lotus F1 team Renault purchased, that branding is so intertwined with Lotus that Renault had to do something different. Plus, I’m with Abiteboul on this: I would chuck my laptop into Town Lake if I had to tell yet another pair of black cars apart from all the other black, grey, and almost-black cars on the grid. Seriously. Even the matte finish works here by sheer merit of Renault’s car being bright freakin’ yellow. This car is not so dark that all the detail gets lost in a rancid sea of bro-dom that smells vaguely of Axe body spray and desperation. Renault’s yellow is soft and cheerful. The bright color reflects light on the curves a bit better. You’ll never mistake it for yet another black car. I am thinking one good example is the BMW Art Car. Everyone will remember BMW for their fantastic cars: It is a fantastic platform and I am amazed that no one is making better use of that. Small things; small details – but why not? The art car idea is no stranger to motorsports. BMW started inviting artists to jazz up its cars in 1975 and has produced 17 art cars since then, according to this profile on the first art car from Speedhunters. It’s a program that isn’t just great exposure for the artists, but also looks amazing on a race car. I think it is because everyone wants to tell a story about being premium. And if you want to be premium, the obvious thing to do is to be on the dark grey-ish side. Plus you have the teams that will obviously be dark grey or silver like Mercedes and McLaren. So that is already two. And there are a number of teams that want to do the same. So, I don’t know why really people are not going a bit more bullish with their colors. It is like they want to disappear. We don’t want to disappear, it is a statement and there is no hideaway. We will have to deal with what we do on track. We heard “premium” often when we picked designer Andy Blackmore’s brain on the “Darth Cayman” livery for the CJ Wilson Racing team, so the association of dark, classic colors like blacks and greys with upscale branding isn’t just a trend in Formula One. That’s fairly common around the world. Problem is, it’s led to a big branding failure for most Formula One teams, as there are too many black and grey cars on the grid. The Mercedes team is the Silver Arrows, so they’re married to it in the same way that Gulf is married to baby blue and orange. It’s good branding for them to keep the silver. Everyone else running a black or grey car doesn’t have much of an excuse. Going for a “premium” color doesn’t mean anything when you fail to to ensure said color will actually stand out on the grid. Abiteboul mentioned McLaren as a team who you expect to run a dark grey, silver, or more recently black car, but at this point, McLaren could bring back their bright orange color from the late sixties and early seventies and everyone would love them even more for it. Article 9 of Formula One’s sporting regulations suggests that Renault may be married to their yellow for a while, regardless. The kinds of in-season livery changes Renault wants to do would need to gain approval from the fellow teams and sport’s heads via the F1 Commission, so here’s hoping they’re down with Abiteboul’s plan to shake up the look of the grid. In the meantime, I’m very thankful that the Renaults will at least be easy to spot!